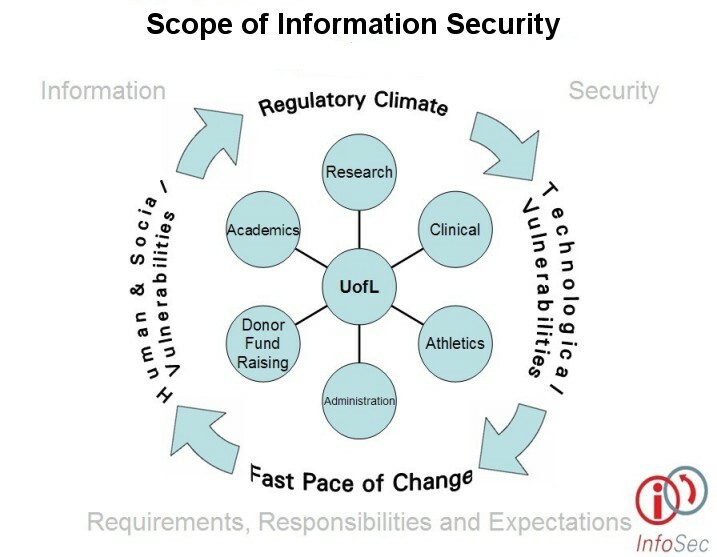 Help the university to focus on its core missions of research and academic excellence by lowering the risk of security incidents which could distract from these missions. An approach that is, where possible, technology neutral that allows for some variation given legitimate requirements so long as the risk is explicitly defined and accepted by a level of directly responsible management appropriate to the risk being assumed. 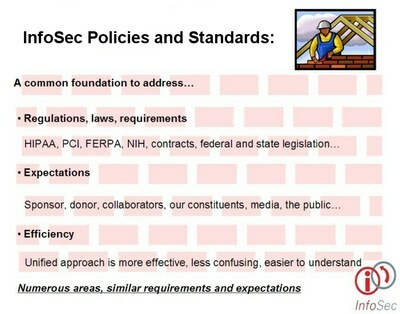 The definitions of what is a policy, what is a standard and what is a procedure also had to be understood. Without this understanding of related but distinct terms, policies tend to become too detailed and take on the characteristics of standards or procedures. Policy - High level requirement statement or paragraph about a type of technology or behavior in the IT environment. Standard - A required approach for conducting an activity or using technology and/or descriptive requirements for a behavior based policy. Once the strategic positioning of the Information Security Policies and Standards was determined, a review and comment process was initiated so university constituents would have an opportunity to voice suggestions and concerns.